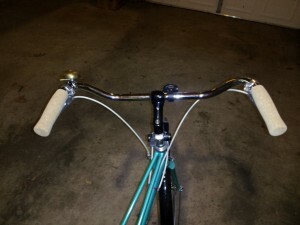 The new handlebars with the newly installed cork grips! The brake lever positioning isn’t quite what I’d like as when the levers are aligned under the grips, you can’t fully depress the levers which equals a loss in braking power which is BadNews! As it stands, I’ve rotated the levers so they’re a bit off center. You get full braking power, but at the loss of the clean and svelte lines I was looking for, and on a mixte, it’s all about the clean and svelte lines, right?